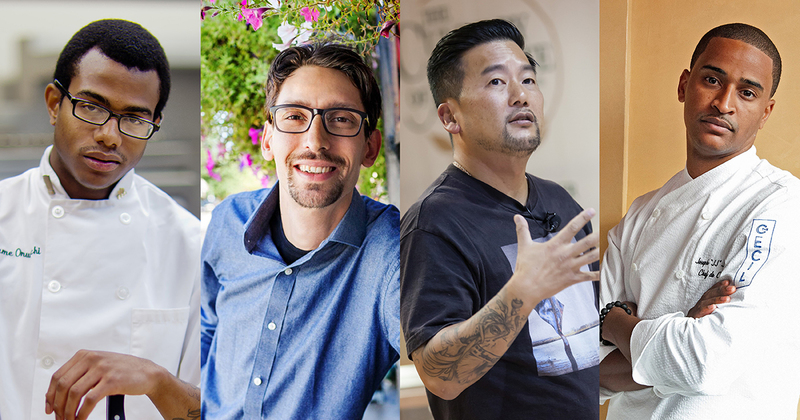 Hyde Park, NY – According to a classic rock song, you know you’ve made it when you get your picture in “the Rolling Stone.” Four graduates of The Culinary Institute of America have definitely made it, being named Rolling Stone magazine’s Breakthrough Rock Star Chefs of 2016. The CIA alumni who have achieved what Dr. Hook and the Medicine Show only dreamed about in their 1972 hit song are Kwame Onwuachi ’13, Abraham Conlon ’01, Roy Choi ’98, and JJ Johnson ’07 (Management). Conlon has brought the Portuguese/Chinese cuisine of Macau to Chicago at Fat Rice, “the most delicious argument for culinary diversity.” Conlon also recently wrote his first cookbook, The Adventures of Fat Rice.